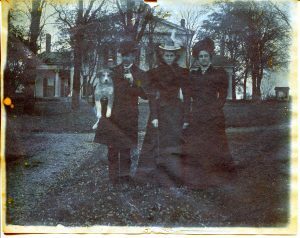 The Martin Smith family (Martin with his wife Anna and their daughter May) moved out to Rose Hill from Geneva in 1896. The Advertiser noted that Maggie Swan and Agnes Swan Hutchins would “not feel at all sorry to see that farm come into the possession of M. H. Smith, a warm friend of their father” (February 18, 1896.) Mr. Shires of Maxwell farm said “Mr. Smith bought the farm very cheap.” (This was a depression age.) The Times reported on September 4 that Mr. Smith only paid $17,000 for it” [about $483,000 in 2018 dollars.] Mr. Smith’s eventual obituary says that he was born in Geneva in 1848, and that he attended the local schools and Poughkeepsie Business College. He was politically active and a Republican. At various times he was justice of the peace, Police Justice for Geneva, Ontario County clerk, served on the Board of Health and the Board of Trade, an alderman, a member of the Board of Public Works, Parks Commissioner, and the local fuel administrator during World War I. He was also active in the North Presbyterian Church. Mr. Smith’s father George Smith was a farmer in the town of Seneca, so Mr. Smith would have grown up on a farm (Advertiser, November 22, 1898.) He may have moved to Rose Hill because he missed country life. The Gazette mentioned that “The mansion has 28 rooms, is heat[ed] by steam and lighted with gas generated on the premises.” Robert Swan had put in steam heat some time before 1877. The gas lighting would have been carbide lighting (this became available for rural homes around 1894). Carbide mixed with water makes acetylene gas, and people could pipe it through their houses if they lived too far away to get town gas or electricity. It seems that Mr. Plummer’s 1890 generator and electrical systems were gone, possibly repossessed. 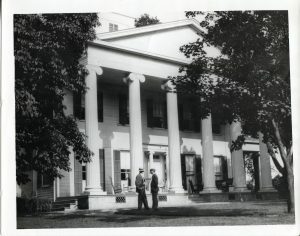 We have a small insight into the lives of Rose Hill’s workers during the Smith era. On September 26, 1900, the Times reported about one of them being robbed of $1.25. The good part of the story is that the victim had $25 on him, but the robber didn’t find it. The article incidentally tells us that the young men of the farm had bicycles and rode them into town on Sunday nights. On October 10, 1912, the Advertiser-Gazette reported that Mr. Smith had sold his farm to Edgar Boody of Brooklyn, who would take possession the following March. Apparently, Mrs. Smith preferred city living as the paper report – “The sale is entirely satisfactory to Mrs. Smith, who will shed no tears when the first of March rolls around . . . “ The Smiths moved to South Main Street in Geneva. Mrs. Smith lived only to January 1915, but Mr. Smith lived until 1939.